First off, let me start by saying that I hope you and your family had a nice Easter this past weekend! The weather was gorgeous in Dallas and I definitely wanted to play outside all day with these two beauties. 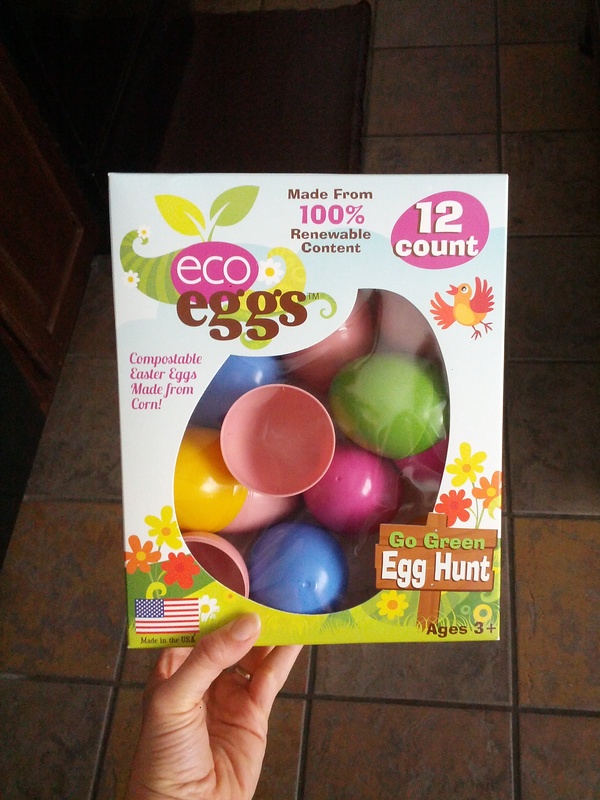 What fueled this year’s Easter, were these cool compostable Eco-eggs that I found at the Nappy Shoppe in Plano. Ya’ll know I love this cloth diaper/baby carrier store, and the minute I saw these beauties, I knew I wanted to get my paws mitts on them. I waited until it was closer to Easter to grab ’em and had to contrive a way to hide them from Emma (the girl sees everything!). 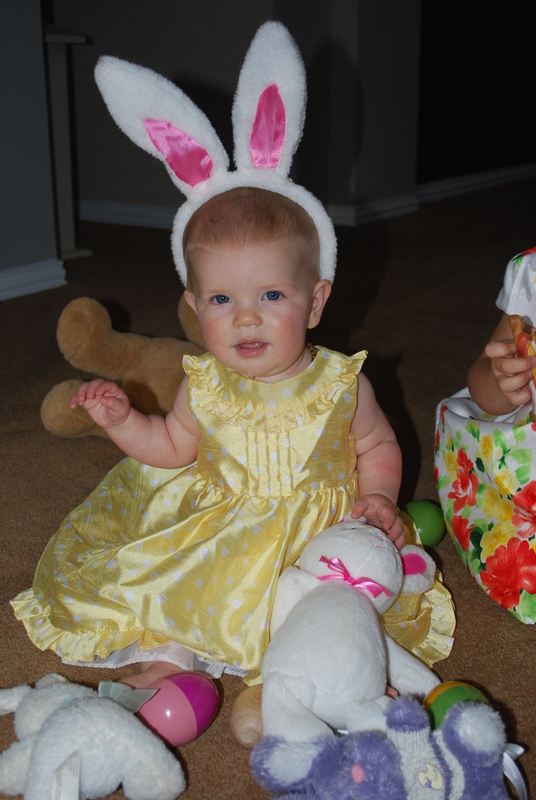 I ultimately wanted to turn them into an educational toy, but thought I’d start with giving them to her for Easter. They are made from corn and are compostable, sustainable, and reusable. It’s like a crunchy party in a recyclable box! I was inspired by something I saw on Pinterest and set about to fill the eggs with non-candy items, like a tic-tac-toe game and a couple of slap bracelets. My intent was to put puzzle pieces in the eggs as well, but the puzzle I found was too big. Oh well, sometimes it’s fun to stuff eggs with toys you already have lying around…like this wooden garden set a friend had gotten for her. I love that my parents respect our wishes and are always on the hunt (no pun intended) to find gifts for the girls that don’t entail candy. What’s better than candy you ask? Money! 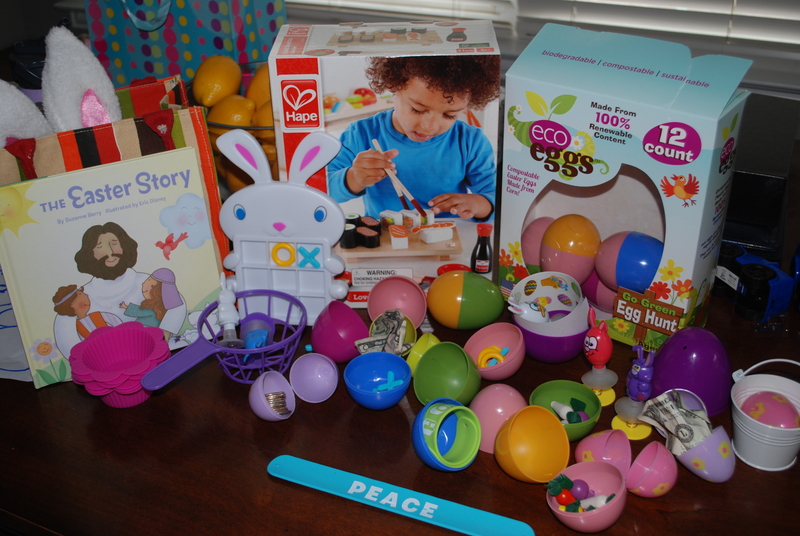 They kept asking what to get for Easter, and since I responded too late, they sent the girls money-filled eggs, an egg catching game, some stickers, and a story about Easter. 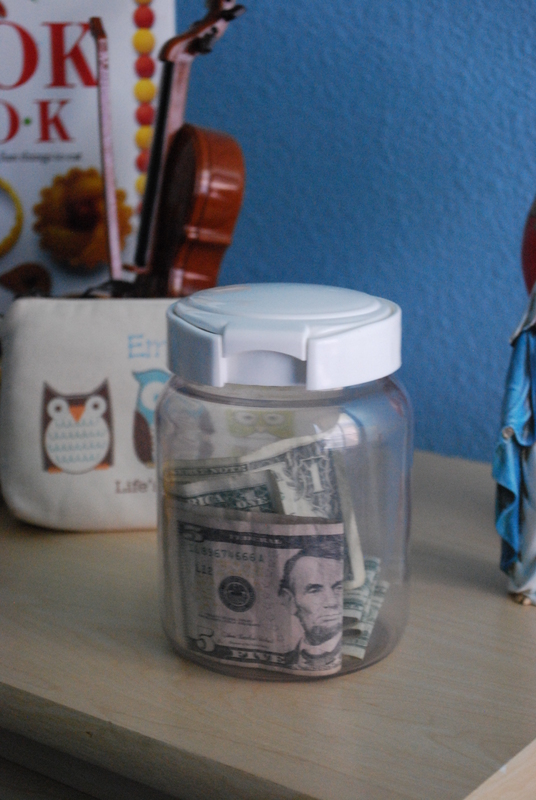 We split the money evenly between the girls, giving Emma the extra dollar and quarter since she is older, and put it in their save envelopes/piggy banks. Ever since Emma had her first birthday, I have always “suggested” gift ideas when I send out her Evite. 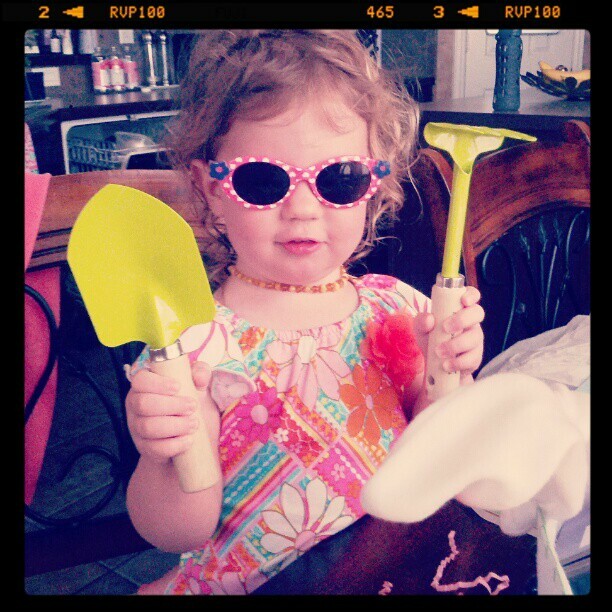 It might be tacky but this mama didn’t want a barrage of plastic toys coming into our home. So it has now become a tradition for me to put these ideas on her invitation year after year. Does it always turn out the way I hope? Not always. For those of you wondering, my normal birthday suggestions are clothes (usually a year larger than what she’s currently wearing), college money, books, shoes, and an Amazon wish list that I add to throughout the year. I’m big into educational toys, so the list is a way to get specific toys for those who still.must.give.the.kids.toys. 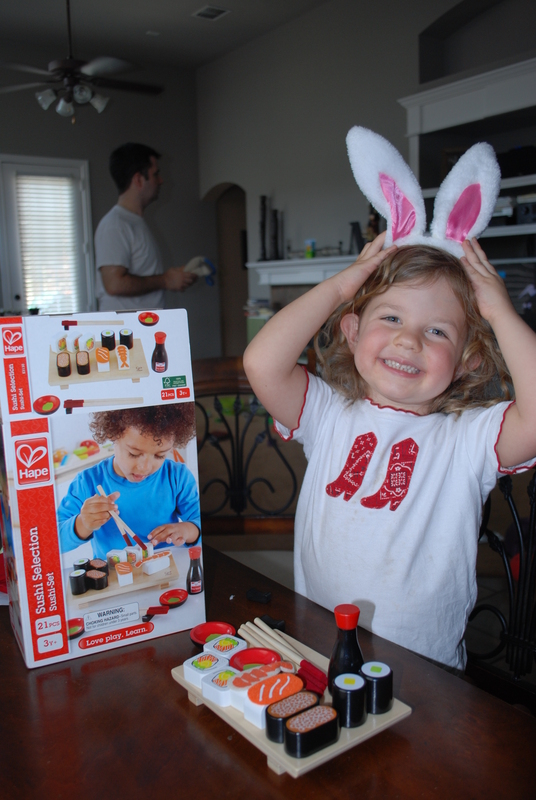 The biggest hit for Easter, though, was this wooden sushi set (also from the Nappy Shoppe). Emma has had her eyes on it for months and has been doing chores here and there to save for it. Every time we go into the store she asks if she can get it, and I let her know she still needs to do some more chores until she has saved enough. Little did she know that when we were visiting the store for the millionth time, and happened to see it on sale, I picked it up along with the Ec0-eggs. 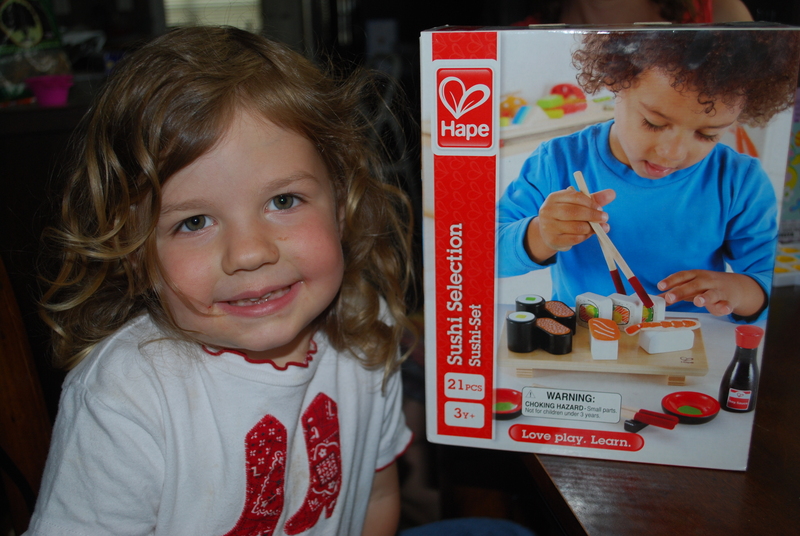 I told Josh the sushi set was on sale and he immediately asked if I got it. Does this guy know me or what? He originally suggested we keep it for her birthday in July, but on Easter day I asked if we should give it to her then. I totally phoned getting Emma anything until the actual day. As you can tell from her face, she was in love! It’s so fun to see what kids get excited about…especially crunchy ones. Ha. What about you? Did you do anything special for Easter? 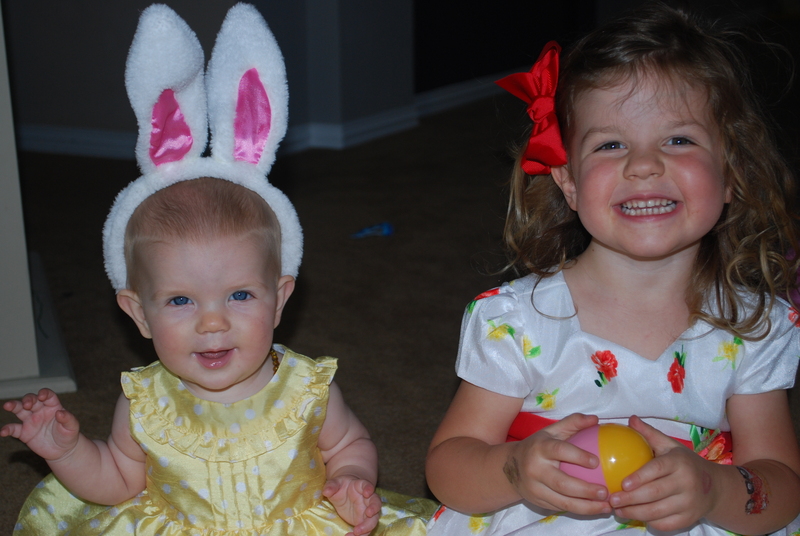 Do you do traditional egg hunts and load the kids up with sugar or is it just another day?